Damodar Kunda Tour By Helicoptor Highlights. Cultural program on arrival day. Aerial view of high peaks. Damodar Kunda – Sacred pond of Hindus. 1 : 30 minutes exotic ride. Damodar Kunda tour by helicopter is designed tour for those pilgrims who desire to explore the holy surrounding and take a bath into the holy lake Damodar Kunda. Damodar Kunda situated at Upper Mustang one of the most beautiful natural wilderness and also a rain shadow area of Nepal. In the column of Barah Puran; Lord Krishna have said that who pays a visit to this Kunda and takes a deep-bath, they will be freed from all the sin. According to the Hindu mythology this delighted site has an important aspect for their Hindu Pilgrims because of its importance in Hindu religion. Damodar Kunda the Holi site of Nepal is blessed with religious importance, natural serene and cultural beauty. Tourists and pilgrims throughout the world come to visit this Holi site and observe the natural and cultural beauty of it. 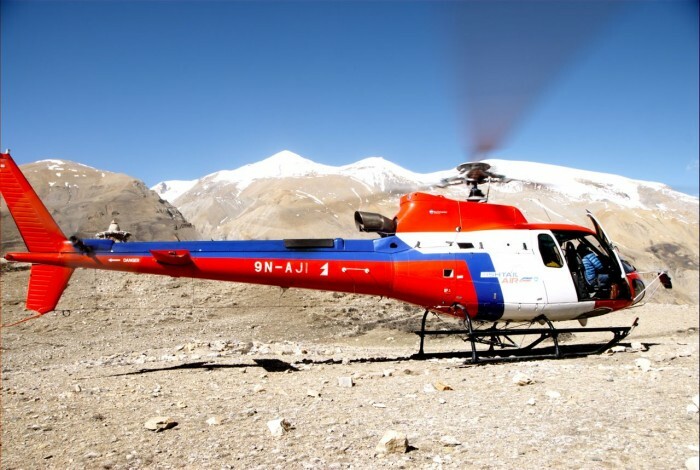 Commence Damodar Kunda tour via helicopter and enjoy the natural serene of mighty Himalayas of Nepal. Fly above the Himalayas and land into the most scenic and religious site of Nepal. Day 1: Welcome to Kathmandu Valley (1360m). Upon your arrival we assist you from international airport to our hotel. Enjoy cultural programs along with delicious dinner. Overnight at hotel. Day 2: Today early morning scenic helicopter flight from kathmandu valley all the way to Damodar Kunda. This 1:30hrs exotic ride above the Himalayas will offer a beautiful wilderness of shinny snow and might peaks. Visit and worship the holy site. Take a dip into the Holy lake Damodar Kunda to erase your sins. After lunch fly back to Kathmandu. Explore leisure time at Kathmandu Valley. Overnight at Hotel.